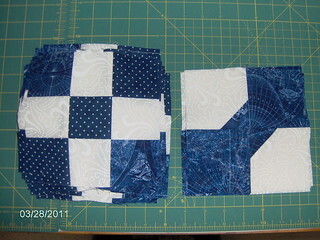 I finished my Nine patches for the One Thing, One Week Challenge at Amy's Creative Side. I even had time to start on the bowtie blocks. Not sure if I am loving the blue polkadot with the other fabric, but too late to turn back now! LOL! This will be a quilt for my niece for graduation.